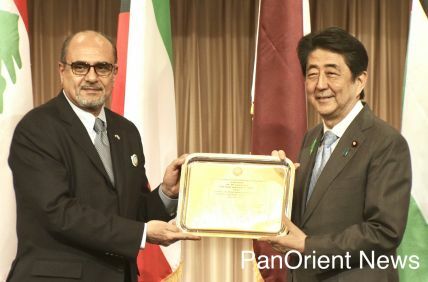 Tokyo- (PanOrient News) Japan is re-inventing its resource diplomacy with full vigor and seems to be more successful at this time. Undoubtedly, Japan's economic ties with Uzbekistan are highly strategic-oriented. The relationship is a fine combination of natural resources and highly developed industry, a win-win situation for both countries. The situation in Afghanistan and Pakistan is central to both Uzbekistan and Japan in developing and expediting trade relations in across East and Central Asia. The president of the Republic of Uzbekistan, paid a three-day official visit to Japan from February 8 to 10. 2011. He held talks with Japanese Prime Minister Naoto Kan, had an audience with Emperor Akihito and Empress Michiko, met with Minister of Foreign Affairs Seiji Maehara, and Japanese parliamentarians, with the aim of boosting mutual ties in a wide range of areas from security to terrorism, education and health to the development of mineral resources and infrastructure. In the past, Japan had fewer links with Central Asia as the region was overtaken by the former Soviet Union. Therefore, Japan's wartime potential links were cut off. The Russo-Japanese tussle in the beginning of the previous century also discouraged the development of Japan's links with Central Asia. Second, Japan’s confrontation with the British in South Asia further prevented Japan from developing any kind of links with Central Asia. Thus, up to 1945 no solid links were established between Japan and Central Asia. Japan's close security ties with the United States after World War II also resulted in its weak links with Central Asia, and its strategic tension with the former Soviet Union hindered ties with the region of Central Asia. After the disintegration of the Soviet Union, Japan established diplomatic ties with Uzbekistan in 1992 and came up with Silk Road Diplomacy under Prime Minister Ryutaro Hashimoto by the mid 1990s. Since 2002 both countries have been promoting strategic partnership. The 'Central Asia plus Japan Dialogue' initiated by Foreign Minister Yuriko Kawaguchi in 2004, brings Japan much closer to Central Asian States. Prime Minister Junichiro Koizumi's visit to Uzbekistan in August 2006 was the first by a Japanese leader. President Karimov visited Japan in 1994 and 2002. Prospects in the field of mining and industry seem quite bright between the two countries. Uzbekistan is quite rich in natural minerals and rare metals. As a country with few natural resources, Japan would be looking more eagerly at the development of Uzbek mineral resources so as to diversify its dependency on China. exports to Japan in the fall of 2010, leading to a sharp rise in prices. Upset by Chinese exports, Japan is already exploring industrial metals from Mongolia, Vietnam, and other countries. Uzbekistan presents the most lucrative ground for Japan to exploit natural resources at this critical time. The future of energy- and mineral-deficit Japan is closely linked with Uzbekistan and other Central Asian states that are rich in natural resources. Highly developed Japanese industry needs all kinds of minerals and rare metals to overcome its economic recession. In return, the foreign reserve-strapped Central Asian states could quickly jump to financial prosperity. In this sense, 'Uzbekistan is geopolitically a very important country to Japan, and at the same time, it is a strategically important partner from the viewpoint of energy and resources', Prime Minister Naoto Kan told President Karimov at their summit in Tokyo. Ahead of President Karimov’s visit, Itochu Corporation of Japan signed a ten-year contract with the Uzbek state-owned Navoi Mining & Metallurgical Combinat to procure uranium concentrate, a type of fuel for nuclear power generation. The deal would provide long-term energy security for resource-poor Japan. It is estimated that Itochu would likely import 500 to 1,000 tones of uranium per annum from Uzbekistan. Uzbekistan possesses the world's 12th largest uranium reserves and it is the world's seventh largest producer of uranium, with its annual output totaling 2,429 tons, and it is the eleventh largest producer of rare metals. The country is also rich in gas and gold. The development of uranium in Uzbekistan for onward shipment to Japan would be much economical than importing from the African state of Namibia, which Japan is presently importing from. Uzbekistan's trade with Japan is slightly lower than its trade with South Korea but the new trade agreements would boost Uzbek's trade with Japan. The early full operation of Pakistan's Gwader Deep-seaport would be a central point in promoting the exports of Uzbek's uranium to Japan by substantially reducing time and costs. One could imagine how Afghanistan's crisis is preventing the development of new businesses and markets between mineral-rich Central Asia and energy-deficit East Asia. The joint statement issued at the end of President Karimov's visit has expressed their continuing commitment to providing support for Afghanistan from the standpoint that the stabilization of Afghanistan is essential to securing stability in the region. Both President Karimov and Prime Minister Kan reconfirmed their ongoing cooperation in preventing terrorism in Central Asia indicating the deteriorating situation in Afghanistan. The country is both bordering Uzbekistan and Pakistan in case sea-borne trade was initiated between Uzbekistan and Japan for the shipment of minerals. Apart from uranium, both countries could develop mutual cooperation in the fields of energy conservation, renewable energy, and alternative energy besides a number of other mineral development projects for mutual benefit. Besides mineral development, the joint statement declared cooperation in political, economic, and global areas in addition to mutual cooperation in railway electrification for which Japan will provide US$ 219 million to electrify the 325 km Karshi-Termez Railway. Education, healthcare, and infrastructure development in the Republic of Uzbekistan will be other areas of cooperation with Japanese financial and technical assistance. 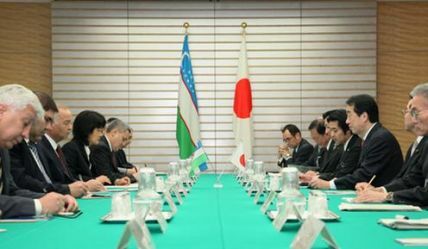 The joint statement has laid heavy emphasis on the promotion of trade and the attraction of Japanese investment in the Republic of Uzbekistan. President Karimov’s visit to Tokyo is in line with Japan's resource diplomacy to boost its trade and to develop more economic relations across natural resource-rich Central Asian nations. The visit came at a time when Japan is in the severe grip of recession, stagnation, and tension in East Asia ,particularly with China over the access to natural resources, and Russia over the Northern Territories that is damaging the prospects of Siberian natural resources for the use of energy-deficit Japan. Policy makers in Tokyo have thus warmly welcomed President Karimov to find a substitute to Chinese and Russian supplies. Uzbekistan is a good opening for Japan. It would come out of this tension-ridden region where its ties with China have been disturbed and its ties with Russia have been deteriorating in recent months. It is a good substitute for Japan to explore natural resources in Central Asia. Such thinking, in fact, is leading the leaders of both Japan and Uzbekistan to rediscover opportunities for the future mutual benefits. The importance of Central Asia is growing in Japan almost at the level of the oil-rich Middle East. Uzbekistan is speedily moving toward a market economy and privatization. The country will be a good testing ground for Japanese investors where they would find all opportunities, which they usually demand for investment in other countries. They could find enormous room for a promising investment in various diverse sectors of the Uzbek economy. It is anticipated that Japanese businessmen could help in boosting Uzbekistan's ambitious privatization program, too. similar to East Asian miracle that occurred in recent past. Dr Ahmad Rashid Malik is Fellow of The Japan Foundation in Tokyo. He is an expert on Pakistan-Japan relations and frequently writes on Pakistan' economic relations with East Asia, Central Asia, and the Middle East.